Donna Smyers is one of the Green Mountain State’s grittiest athletes, with more than 25 years of racing triathlons under her belt. She nailed a 2:59 Boston Marathon, won her age group in the Ironman World Championship in Kona six times, completed the Mount Washington Road Race nearly 20 times and was the only Vermonter to win her age group at last year’s USA Triathlon National Championships in Burlington. This year, she won the title again, clocking a 2:24 in last Saturday’s Olympic distance race to top women ages 55 to 59. But there’s another top in sight — the Race to the Top of Vermont, this Sunday, August 26. Every year since 2008, when the 4.3-mile slog to the summit of Mount Mansfield was founded as a fundraiser for the Catamount Trail Association, Smyers has either run or mountain biked all the way up Stowe. Smyers, a physical therapist, reveals this to me on a recent Tuesday-morning run, during an easy and picturesque loop around Sodom Pond in her town, Adamant. I’ve met Smyers before — or at least I saw her backside as she passed me on my own way up Mansfield in August 2009. Despite suffering from the flu, I decided to run the Race to the Top and was humbled by dizziness, nausea, breathlessness and the initial steep climb. Smyers finished in a blistering 45:56, second (among female runners) only to world mountain-running champion Kasie Enman. By the time I crossed the finish line after a miserable 53:28, Smyers was already well into recovery mode, stretching and laughing with friends in the mountaintop fog and looking for a ride back down to the base. So when I’m given a chance to join Smyers on a run from her office, Fixer-Upper PT, I pounce, eager to get some training tips as well as learn what makes her tick so darn fast. Yep. 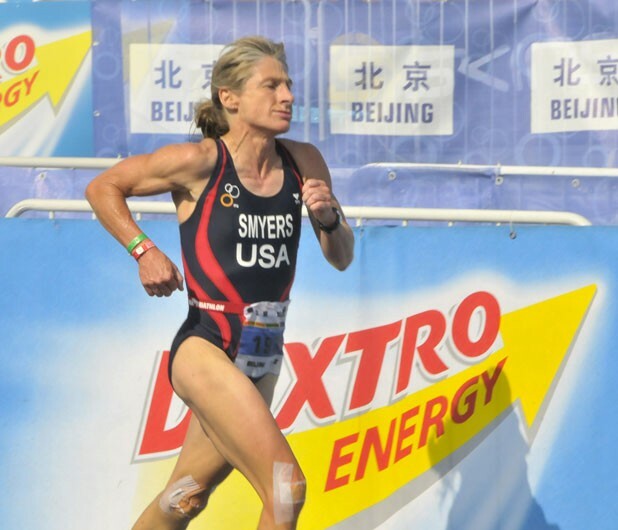 Though she insists she was “strictly midpack” in her triathlon efforts of the early ’90s, Smyers has since dominated her age group in triathlons, afraid neither of the race timing clock nor of the internal one that might tell other women to slow down as they age. Putting in 10 hours a week of training most of the year, and 20 or more in the weeks leading up to an Ironman distance event, Smyers tops results list after results list. “If you’re mechanically sound, running isn’t bad for you,” says Smyers, who says she has gotten lucky when it comes to injuries and health. She’s dropped out of only one race because of a bad cold that made her cough every time she ran, and has learned when to back off in her training. The only time she’s gone to the medical tent (knock on wood) is to participate in scientific studies of endurance athletes. So is her strategy for the Race to the Top, which, now in its fifth year, is presented by the North Face and expected to draw some 800 runners, bikers and hikers from across North America on Sunday. Smyers has the same nutritional plan for every race, too: a breakfast of cereal, milk, coffee and fruit. She might refuel with electrolyte drinks and sports bars and gels (“my fallback is orange Gatorade,” she says), but the postrace ritual stays the same. “Try to eat real foods, real soon,” Smyers says of her recovery diet of chocolate milk, yogurt and turkey sandwiches.